The Volkswagen CC’s stylized sweeping roofline, dramatic body detailing, low-to-the-ground stance, and elegant frameless side windows, offers expressive, head-turning coupe-like design for the cost of a traditional sedan. 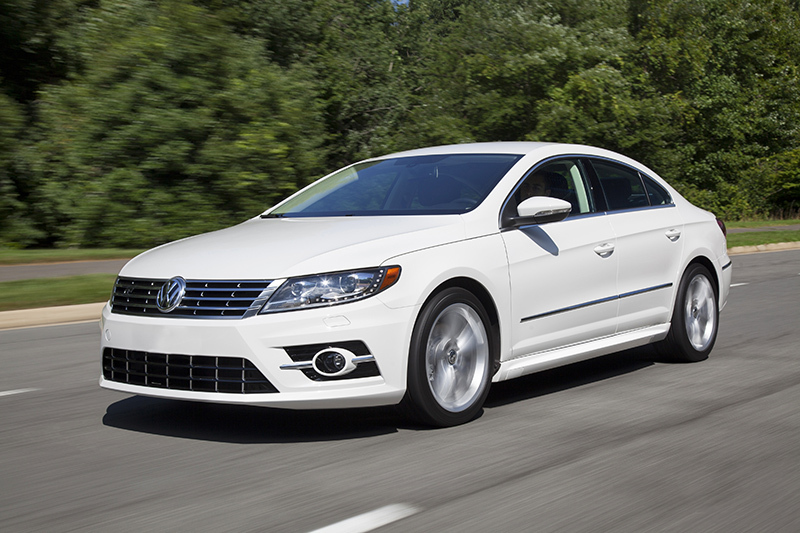 The 2015 VW CC sees few significant updates, following the addition of standard navigation and VW Car-Net® connected services to all CC models in 2014. The 2015 changes are limited to appearance upgrades including new optional 18-inch St. Louis wheels for the Sport trim and available 18-inch Shanghai pattern for the Executive trim line. The design team, led by Klaus Bischoff, head of design for the Volkswagen brand, was the brains behind the CC model’s overall look inside and out. At the front of the car, one’s eye is drawn to the CC’s radiator grille, Bi-Xenon headlights, and hood design, which correspond closely to the clean lines of Volkswagen’s “design DNA”—with an emphasis on horizontal lines and precise harmony between the headlights and radiator grille. 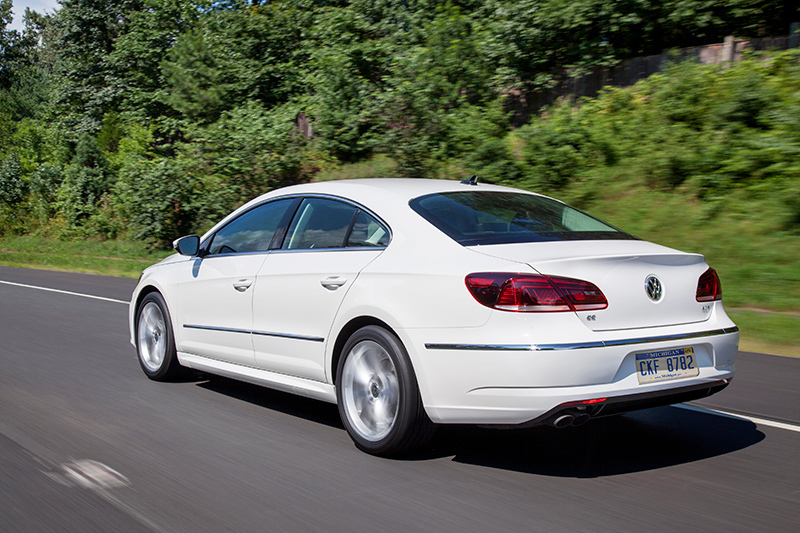 Like the Passat, the CC also has an extra air intake in the lower section of the bumper. The foglights are housed inside “winglets” that are integrated in this intake. The striking headlights on the CC feature Bi-Xenon technology. LED Daytime Running Lights are integrated in the headlight design and the Adaptive Front-lighting System (AFS)—which can turn the beams by up to 15 degrees around corners to help increase visibility—is also featured. At the rear, the CC’s distinctive LED taillights finish with a horizontal sweep at their lower ends. The distinctive look of these lights makes the CC unmistakable from the rear, day or night. The license plate is illuminated with LED lighting as well. Compared with the Sport model, the R-Line gains a more aggressive front bumper design that incorporates a large lower air intake and projector-style foglights that have a striking chrome motif. Side skirts and the R-Line logo on the grille further differentiate it from the Sport model, along with unique and dramatic 18-inch aluminum-alloy wheels. The CC’s cabin is as stylish and design-led as its bold exterior. Each CC model features a blend of luxurious materials, rich textures, and intuitive controls. V-Tex Leatherette or leather seating surfaces are offered and are available in both solid and two-tone color schemes. The front seats are heatable and come with standard 12-way power adjustment, including four-way power lumbar and adjustment for height. Electronic seat ventilation is included on the front seats of the VR6 4Motion Executive model. Up front, a leather-wrapped, three-spoke steering wheel features integrated controls for the CC’s multimedia system. The gauges are surrounded by chrome trim, which extends through the CC Sport range, while the CC 2.0T Executive and VR6 models feature either dark brushed aluminum or engineered ebony trim. The R-Line features stainless-steel R-Line scuff plates, and the DSG® equipped model sports paddle shifters on its multifunction steering wheel. All CC models feature the Climatronic® automatic climate control system. Typical of the attention to detail in the CC, the system features a humidity sensor located near the rear-view mirror. This measures air humidity and controls the Climatronic system to help prevent condensation and maintain the relative humidity in the passenger compartment at a pleasant level. Another benefit of the system is that the humidity sensor permits operation of the air conditioning compressor only when needed. A variety of entertainment options are available with the CC. The 2.0T Sport and R-Line come with an RNS 315 touchscreen navigation system, rearview camera, SD memory card reader, and SiriusXM® Satellite Radio with 3-month trial subscription. Bluetooth® connectivity and Media Device Interface (MDI) with an iPod® cable are also standard. 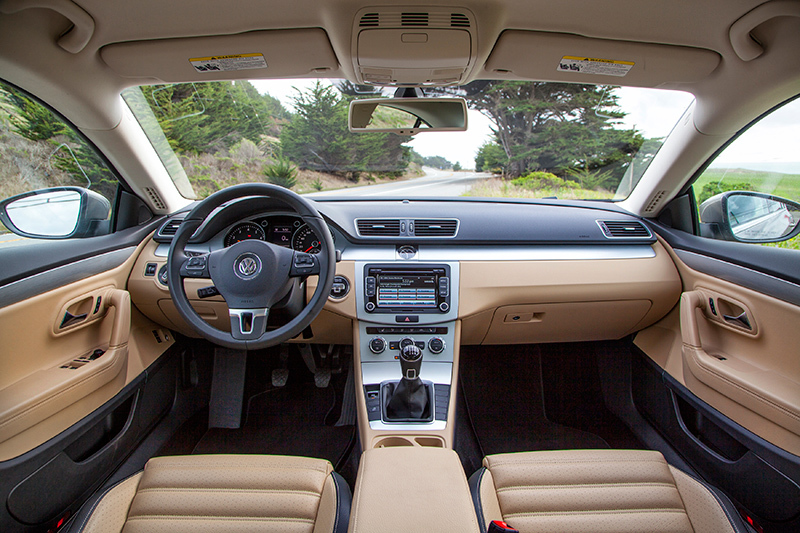 The Executive trims have Volkswagen’s sophisticated RNS 510 navigation system that features a 6.5-inch color touchscreen, a 30GB hard drive with 18GB of music storage, a three-month trial of SiriusXM Travel Link™, a four-year subscription to SiriusXM Traffic™, and rearview camera display. For the flagship VR6 4Motion model, there’s a remarkable Dynaudio® premium sound system, with 10-speakers (four tweeters, two midrange, four woofers) powered by a 600-watt amplifier and Digital Sound Processor (DSP) technology. To add to the versatility and flexibility of the CC, the rear seatback is split 60/40 and folds forward to connect the trunk to the cabin to increase load space. There’s also a pass-through behind the armrest to accommodate longer items, like skis. Another interior feature is remote latching for the rear seatback. Levers mounted under the rear shelf on the right and left sides of the trunk make it easy to unlatch both sections of the split seatback. The trunk itself has a capacity of 13.2 cubic feet. The CC features the award-winning, 2.0-liter turbocharged and direct-injected TSI® four-cylinder engine that generates 200 horsepower and the 3.6-liter narrow-angle VR6 engine that produces 280 horsepower. All 2.0-liter models are front-wheel drive. The 2.0-liter engine is mated to either a six-speed manual or a six-speed DSG® dual-clutch automatic transmission. The six-speed transversely-mounted DSG unit features two wet clutches with hydraulic pressure regulation. One clutch controls the ‘odd’ gears—first, third, fifth, and reverse—while the other operates the even gears. With DSG, the set-up allows the next-higher gear to be engaged, but remain on standby until it is actually selected. In other words, if the CC is being driven in third gear, fourth is selected but not yet activated. As soon as the ideal shift point is reached, the clutch on the third-gear side opens, the other clutch closes and fourth gear engages under accurate electronic supervision. Since the opening and closing actions of the two clutches overlap, a smooth gearshift results and the entire shift process is completed in less than four-hundredths of a second. In addition to its fully automatic shift mode, DSG has a Tiptronic® function to permit manual gear selection. Mated to the manual transmission, the 2.0T achieves EPA estimated fuel economy of 21 mpg city and 32 mpg highway. The VR6 engine is mated to a six-speed automatic transmission with Tiptronic shifting and paddle shifters, driving through all four wheels. 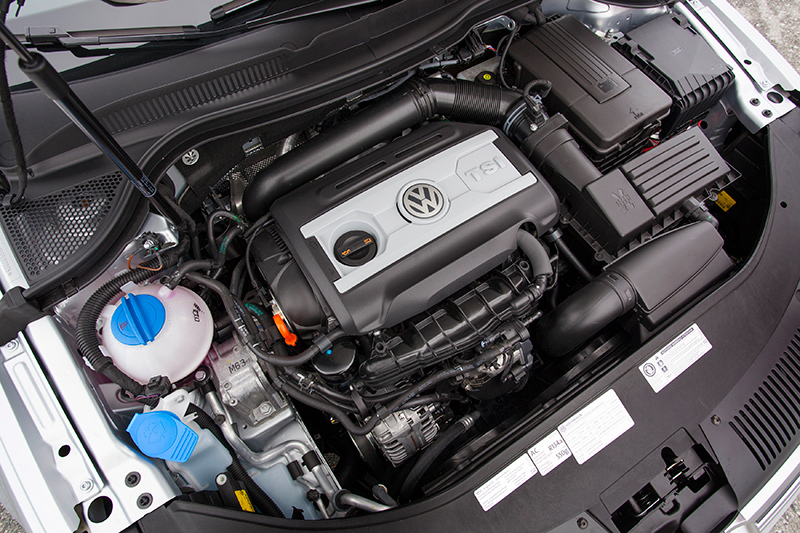 Producing 265 lb-ft of torque, the 3.6-liter VR6 offers refined, responsive performance. The EPA estimated fuel economy numbers are 17 mpg city and 25 mpg highway. All 2014 CC models are equipped with a sport-tuned suspension to satisfy the driver looking for lively, involving handling coupled with a smooth, comfortable ride for daily driving. Up front, there’s a strut-type suspension with coil springs and telescopic dampers, low-mounted lightweight forged-aluminum control arms, and an anti-roll bar. At the rear, the CC has a compact multilink coil-sprung suspension with upper and lower transverse arms and a longitudinal link on each side to control wheel location. It’s a sophisticated arrangement that helps deliver controllable, dynamic handling with a comfortable ride and reduced body roll. The rear suspension components are mounted in a subframe made of high-tensile steel to help reduce weight and increase rigidity. The subframe is also acoustically decoupled from CC’s bodyshell to aid in significantly lessening road noise and vibration. An electro-mechanical, power-assisted rack-and-pinion steering system with variable speed assistance helps ensure driver confidence. Advantages of the system include its mild self-centering action and its ability to help compensate for different driving hazards such as crosswinds and steep road cambers as it dispenses with the usual engine-driven pump. Braking is controlled by the CC’s Anti-Lock Braking System (ABS) with a special wiping feature that helps keep the discs dry and clean for quicker response on wet roads. The Sport and Lux CC models are fitted with 12.3-inch vented discs up front, and solid 11.1-inch rotors for the rear. The VR6 model moves up to 13.4-inch vented discs for the front and 12.2-inch solid rotors at the back. The flagship CC model comes standard with Volkswagen’s proven 4MOTION all-wheel-drive system for even more dynamic handling and nearly all-weather traction. The system delivers drive to all four wheels without any buttons to press or levers to pull. A Haldex® center differential can continuously vary the drive force between the front and rear axles depending on the traction available. When accelerating hard from standstill, for example, front-wheel slip is prevented by the system’s ability to direct nearly 100 percent of the drive torque to the rear wheels. The 4MOTION system also helps provide sure-footed traction over virtually all surfaces, as well as optimum straight-line stability, even in crosswinds. Safety and security in the CC starts with a strong, rigid, laser-seam-welded bodyshell and crash-optimized, energy-absorbing front end. For those inside, there’s the protection of a suite of airbags that includes front and side thorax airbags from the driver and front seat passenger, and Side Curtain Protection® head airbags for those in both the front and rear seats. Three-point safety belts have belt-force limiters for all the seats. The CC also features include front head restraints that adjust fore-and-aft as well as up-and-down. In this design, the head restraint can be pulled forward and, because it lies closer to the head, further helps reduce the risk of whiplash in a crash. For real peace of mind, the CC, like every 2015 Volkswagen, is covered under the Carefree Maintenance® Program at no additional charge. The first scheduled maintenance service is covered for one year or 10,000 miles, whichever occurs first. There are four different versions of the 2015 CC, and each model comes exceptionally well-equipped. The 2.0T Sport provides entry to the 2015 CC model range at a base price of $32,685. Standard equipment includes 17-inch “Verme” aluminum-alloy wheels with all-season self-sealing tires (optional 18-inch “St Louis” aluminum-alloy wheel upgrade); Bi-Xenon headlights with LED Daytime Running Lights and the Adaptive Front-lighting System (AFS); LED taillights; LED license-plate illumination; rain-sensing windshield wipers; Climatronic automatic climate-control; heatable 12-way power front seats; RNS 315 touchscreen navigation system; rearview camera; Bluetooth technology; iPod® connectivity; V-Tex leatherette seating surfaces; VW Car-Net® connected services; and Titanium Silver interior trim. The standard transmission is a six-speed manual with the option of a six-speed DSG dual-clutch automatic. The 2.0T R Line, which starts at $33,785, takes the Sport features and heightens the CC’s performance styling with unique 18-inch aluminum-alloy “Mallory” wheels; a more aggressive front bumper treatment; side skirts; and R-Line door sill plates. 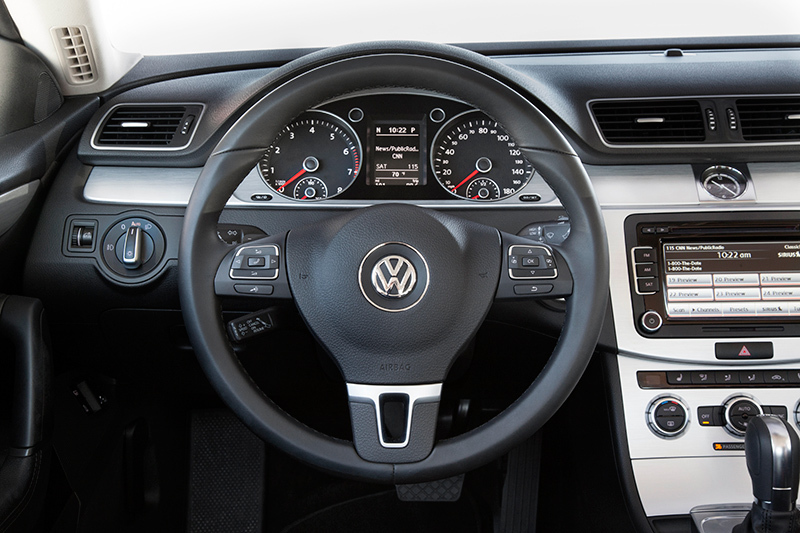 The multifunction steering wheel features paddle shifters for the optional dual-clutch DSG automatic transmission. The 2.0T Executive builds on the Sport’s extensive standard features and adds: a six-speed DSG automatic transmission; 18-inch “Shanghai” aluminum-alloy wheels; engineered ebony interior trim; leather seating surfaces; memory seating and mirrors; a power-tinted-glass sunroof; ambient lighting; RNS 510 navigation with 6.5-inch touchscreen; SiriusXM Traffic™ with a four-year subscription; Sirius Travel Link™ with a three-month trial subscription; easy-open hands-free trunk access; and keyless access with push-button start. The model starts at $37,705. The VR6 4Motion Executive Lux features the 280-hp, 3.6-liter VR6 engine mated to a six-speed automatic transmission and 4MOTION all-wheel drive. The base price is $43,140. Compared with the 2.0T Executive, it adds a headlight washer system with heated nozzles; “Lakeville” 18-inch aluminum-alloy wheels; Tiptronic paddle shifters; front seats with ventilation and driver’s seat with massage function; Park Distance Control with front and rear proximity sensors; Dynaudio Premium Sound System; and a power rear sunshade.